1. Partisan divides dwarf demographic differences on key political values. The average gap between the views of Republicans and Republican-leaning independents and Democrats and Democratic-leaning independents across 10 political values has increased from 15 percentage points in 1994 to 36 points today. 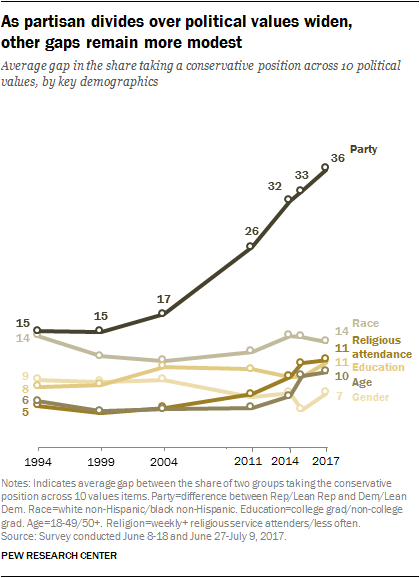 Two decades ago, the average partisan differences on these items were only slightly wider than differences by religious attendance or educational attainment, and about as wide as differences across racial lines. Today, the partisan gaps far exceed differences across other key demographics. 2. Donald Trump’s presidency has had a major impact on how the world sees the United States. A global median of just 22% have confidence in Trump to do the right thing when it comes to international affairs, according to a survey conducted last spring. 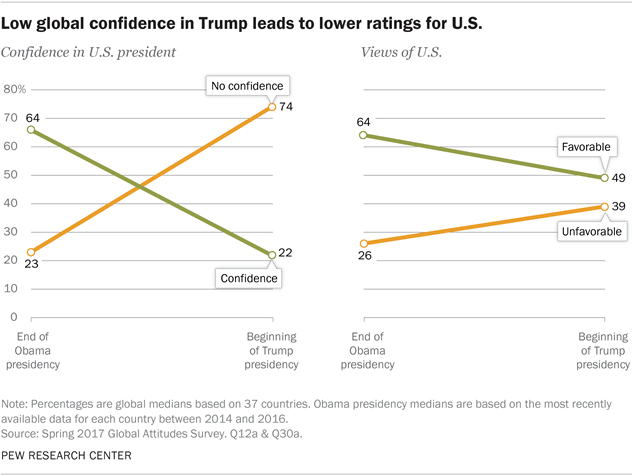 The image of the U.S. abroad also suffered a decline: Just 49% have a favorable view, down from 64% at the end of Barack Obama’s presidency.